For an investment of over €40m, Volvo has radically redesigned the 9000 range and introduces UK buyers to the 9900 – a replacement for the current 9700. 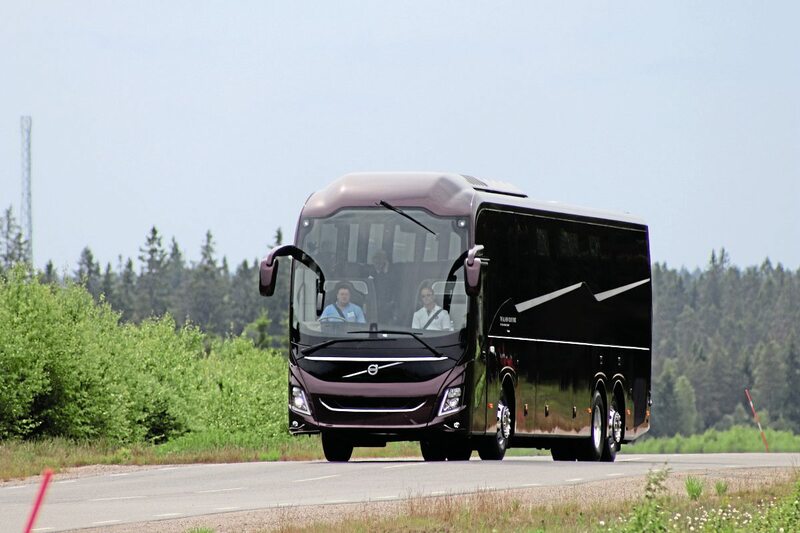 Although the mechanical aspects are carried over from the existing B11R, the coaches are now integrally constructed, weigh up to 350kg less, have an imposing new look, incorporate additional safety features and promise buyers lower operating costs than the models they replace. Built exclusively at the Wroclaw plant in Poland, the new family breaks tradition in being of integrals rather than body-on-chassis, enabling greater economy in weight among other advantages. Replacing the former 9500, 9700 and 9900 models of which only the 9700 was available in the UK and Ireland, the new line up offers six or, arguably, nine basic models. At the top of the range is the 9900 which will be offered in three lengths; 12.4m on two axles and both 13.1m and 13.99m on three axles with all models retaining the trademark theatre-style sloping floor that can be traced back to the Drogmoller range that Volvo acquired in the mid 1990s. It will be 12cm higher than the previous 9900 at 3.850m high (3.824m without aircon) which will differentiate it from the 9700 family which is 3.65m high (3.624m without air con). Previously both models were the same height but now the 9900 has a larger luggage compartment and a taller windscreen. Both are 2.55m wide and like the 9900 the 9700 will come in three length variants but unlike it, the 13.1m version will be mounted on two axles. Two different executions of the more versatile 9700, Superior and Select, will enable operators to choose that which best suits their operation. Only the tri-axle 13.1m and 13.99m 9900 models will be offered in the UK, replacing the existing 9700 range and giving Volvo a new flagship offering. These have wheelbases of 5.96m/1.4m and 6.86m/1.4m. Standard specifications on these coaches will be 53 plus toilet on the 13.1m and 57 plus toilet on the 13.99m. James Hyde, Volvo Bus Retail Sales Director, said they hoped to offer fully-seated versions at a later stage if there was demand. There are no plans to bring in any of the 9700 options because they would be going head-on with other products already offered. Neither is it the intention to sell the 12.4m, two-axle 9900. It no doubt reflects the importance of the UK and Irish markets to Volvo that the prototype 9900 is a right-hand drive model. This coach has another month of testing to undertake before it returns to the Polish plant to be completely rebuilt to full production specification and when this is complete it will appear at both the IAA event in Hanover and six weeks later at the Euro Bus Expo Show in Birmingham (30 October – 1 November). Although left-hand drive production will begin in September, the first production right-hand drive models are not scheduled to go on to the line until the beginning of December, with the first deliveries likely to be at the end of January 2019. No orders have been placed yet, although a number of UK operators attending the launch have shown interest; as a premium product, it has more equipment than the existing 9700 so is likely to be more expensive, but that the differential is not a massive one. It embodies all of the traditional Volvo values, in particular safety, with a number of improvements and innovations, some optional, that can add to the safety of passengers and crew. The FIP front impact protection system has been further strengthened with two big steel bars helping to maintain integrity in the event of a frontal collision. On all new coaches, Driver Alert Support detects if a driver is drowsy and sends him both text and acoustic messages warning him. If it detects the same symptoms within the following 30 minutes it tells him to take a rest and a coffee cup pictogram appears on the dash. As telematics systems are enhanced, Volvo is offering a new Safety Zone feature that enables the speed a vehicle can travel at within certain defined areas to be controlled from the office. There is no driver override. Apparently, some operators are keener on the idea than others. Free for the first two years on a new coach is a Vehicle Status feature that can show the office exactly what the driver can see on his dash display, with notifications available via smart phone. For those that want it, comprehensive fleet management is available that provides invaluable tools for running the business and keeping down costs. Also new, though it will not be standard in the UK, is the I-See predictive topography system which Volvo claims can deliver a fuel saving of between 0.5% and 2.5%. Overall, Volvo claims that, with the improved aerodynamics and reduced weight, the 9700 should use up to 4% less fuel than its predecessor, and the 9900, though 20cm higher and 10cm longer, will deliver the same fuel economy. One of the advantages of moving from body-on-chassis to integral construction is the opportunity to reduce weight. The combination of fewer chassis parts and a complete rethink of the roof structure with a one-piece composite structure replacing steel profiles has resulted not only in an overall weight saving of around 350kg, but also a significant lowering in the vehicle’s centre of gravity, with additional safety advantages as a result. The roof changes alone account for 230kg less weight. Also of note is that during production of the frame, all welding and cutting of the structure is entirely completed before the structural protection coatings are applied. 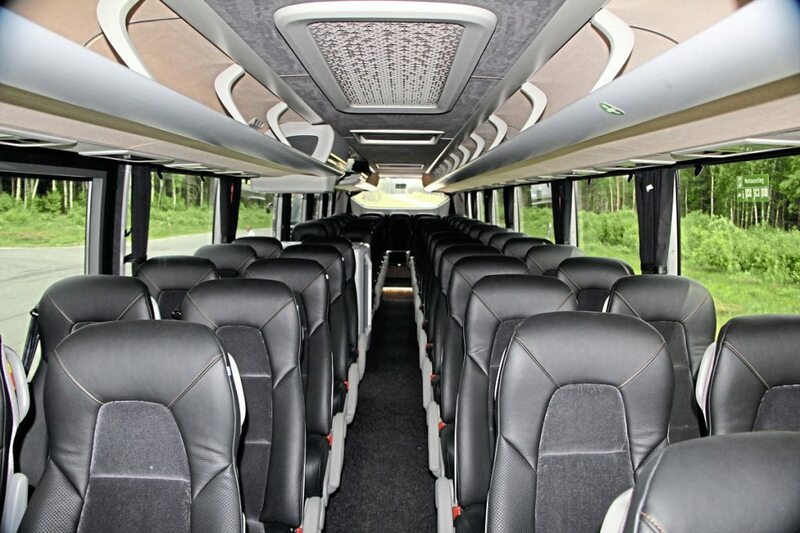 If the initial reaction to the appearance of a new coach is important, then mine was drawn from a picture of the front I saw a couple of days prior to attending the launch when I though it had rather a ‘heavy’ look. When I saw it in the metal, my response was completely different; the frontal styling suggests solidity and security and the wavy, ascending line along the bodyside of the 9900 somehow joyful, even frivolous and probably not what you expect to see from the generally rather conservative Volvo. I liked it. 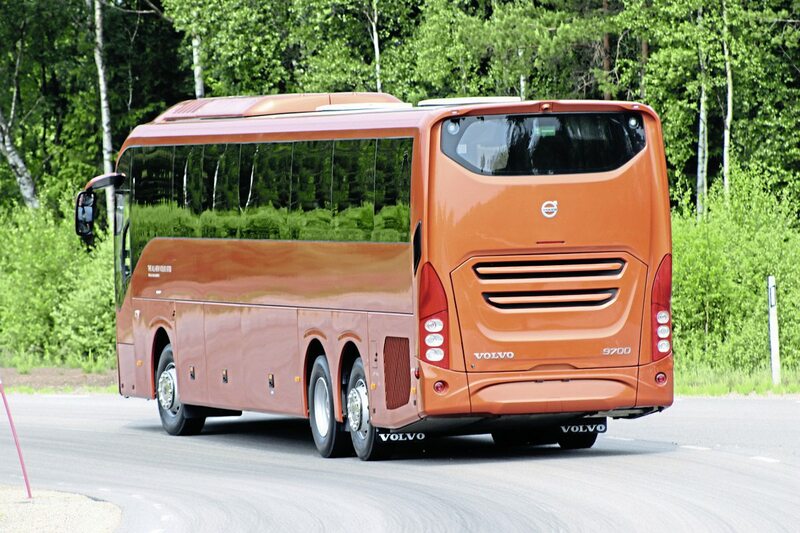 It was explained during the presentations that Volvo looks to encompass its brand (the iron mark with its diagonal line) within the glazed frontal section across its different vehicle ranges but it has done so in a way appropriate to a luxury coach, something some other manufacturers have been less successful at achieving when trying to apply a family look across commercial vehicle sectors. The rear is attractive too, with sculpting designed to assist the aerodynamics by encouraging air past quickly without depositing dirt on the way. I’m sure operators would rather the badge on the rear were lower mounted as it sits where they may well want to add the company name or logo, but this is a minor point, the important one being that the coach as a whole has presence. Turning to the interior I confess I was disappointed by the entrance, which is narrow by the standards of the premium sector and certainly narrower than that on the previous generation. It also lacks a handhold to the boarder’s right (on right-hand drive coaches) which makes climbing the stairs more difficult. 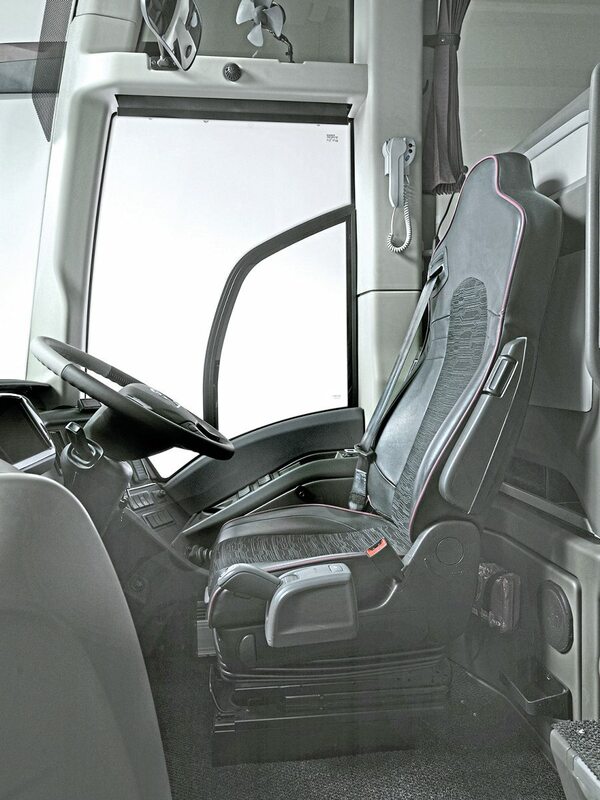 The cab area itself has been completely reworked and seems to be ergonomically well thought out, the driver’s chair swivelling to aid entry and egress. I can admit it now; I always hated the brushed aluminium unit down the centre of the ceiling on the old 9700 which seemed too flimsy for a coach of this kind, so I was delighted when I reached the top of the stairs and saw that this has gone on all versions. In its place the look is simple and elegant, with neat mouldings, a pretty good balance between plastics and softer materials, and efficient heating and ventilation. 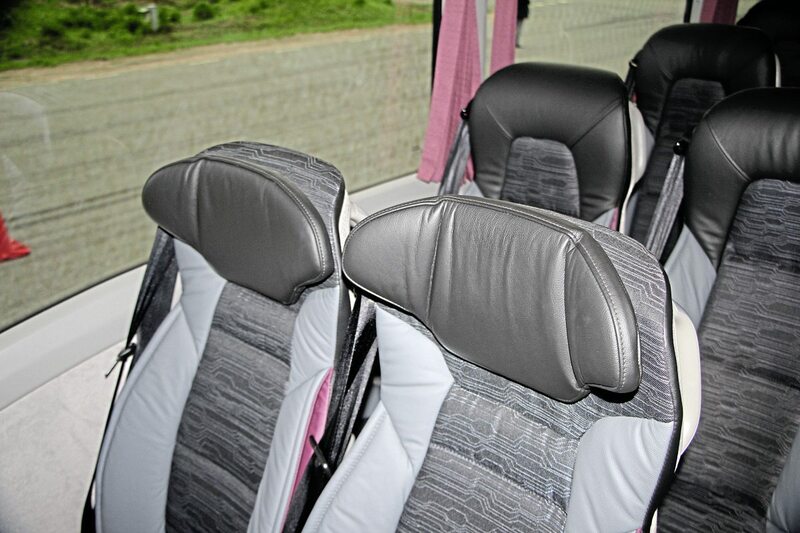 The 9900 has solid rack locker doors and a toilet compartment with plenty of headroom, and though the undulations of the side windows do create some unusual angles for the window cappings I do not see this being a problem. All of the interior lighting (indeed all lighting with the exception, for now, of the headlights) is LED. 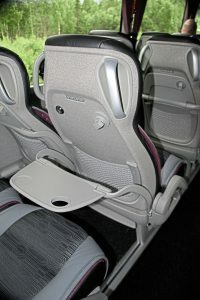 Volvo designed the seats which are manufactured by Kiel. I was told that four different seat specifications are offered on the 9900, complete with seatback USB points. I must preface this section by saying that the vehicles we were shown were the first prototypes, with both pre-production and production stages to be gone through before vehicles reach customers. There were a number of rattles I would expect to see eliminated, especially around the centre-mounted toilet compartment and it was noisier at the rear of the interior than it will be once optimised, but nevertheless it provided a very comfortable travelling experience, enhanced by the excellent view afforded from every seat. Though I like the 9900s theatre seating, I did find the proximity of the ceiling at the rear row slightly claustrophobic. The coaches were only carrying a few fellow journalists as we lapped the test track but there was plenty of power and it was delivered smoothly exactly when you wanted it. Both were always stable and though sometimes bouncy at the front, this was down to the surface of the track in places. There were differences between the two coaches we were shown. 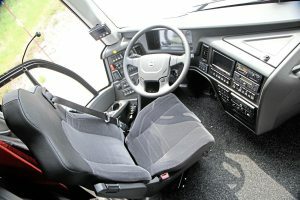 The 9700 had the I-Shift controlled by DNR buttons, whereas the 9900 had the joystick control alongside the driver’s seat along with a button that allows manual gear selection, though I did not try this feature. I found it slightly annoying that both the retarder lever and the wipers are on stalks often hidden behind one of the spokes of the steering wheel and would prefer to be able to see them, especially as if you knock the lever back too far it turns the retarder off and you get an audible warning this has happened. Rather more disconcerting during my run in the 9700 was a buzzer, and a red warning display came on instructing me to stop safely. Pulling up gingerly, my Volvo minder told me it was probably a locker not completely shut and to my relief this proved to be the case. 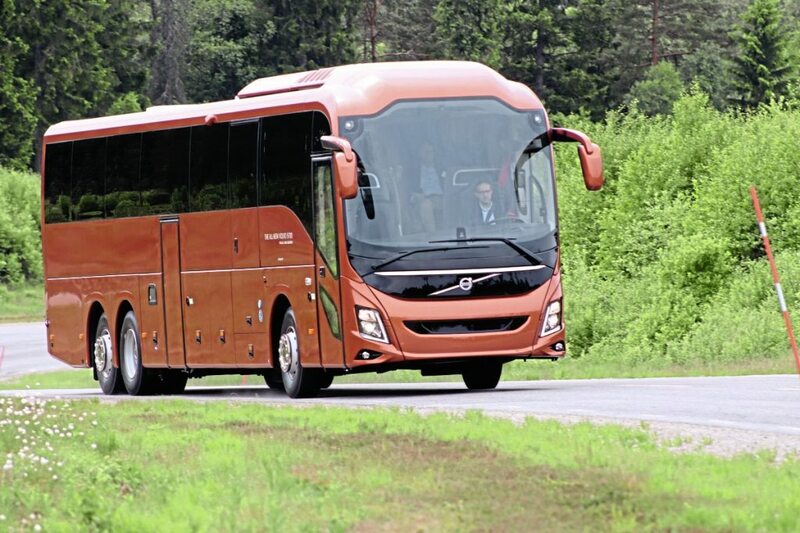 I know some feel that Volvo’s VDS Volvo Dynamic Steering system makes the steering too light, reducing the effort required to steer by 30% at all times and up to 70% in situations such as roundabouts, but I found it made piloting the coach particularly straightforward. Operators clearly like it; 50% of deliveries already have it specified. A large (500mm) steering wheel is standard though there is a 450mm option. I didn’t notice any disturbing blind spots and found the mirrors gave a good all-round view. Volvo promised that everything would be easily to hand, regardless of the height of the driver, and though I didn’t try every button it was easy enough to locate and operate all that I needed. Though leather trimmed on the 9900, I thought the top centre section of the dash a little flimsy and would expect to see it strengthened prior to full production. Almost unbelievably for a new coach launch, there was no mention of the engine options in the presentations I attended at the associated Volvo brands’ Hallerad test facility in Sweden. 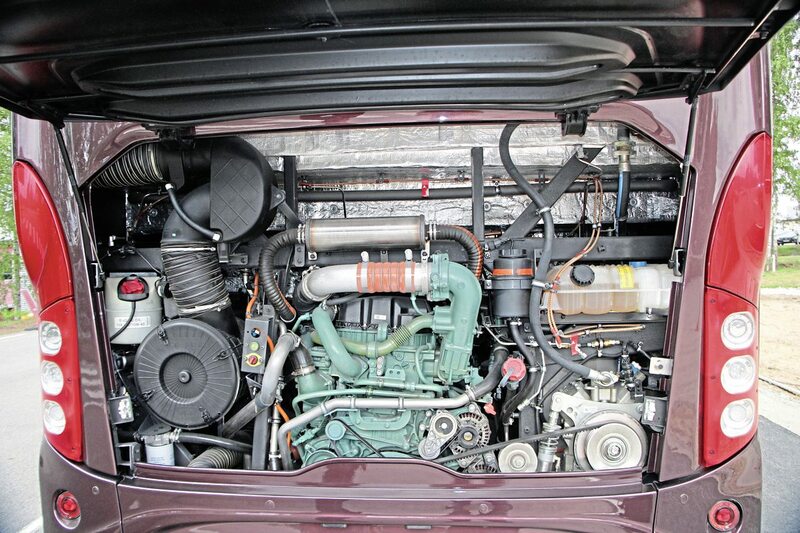 Subsequent questioning revealed that they are the same D11K 10.8-litre engines fitted in the current ranges although by the time they go into production these will be to Euro VI D emission levels rather than the current Euro VI C.
Three outputs will be offered: the 380hp, 430hp and 460hp. The 460hp/339kW delivers peak torque of 2,200Nm at 1,000-1,400rpm. All UK and Irish versions will have the 460hp unit and Volvo’s I-Shift automated manual transmission. I understand that there are no current plans to offer the lower capacity D8K unit in the 9700. Volvo is now on version F of the I-Shift gearbox, having started at version A. Although it is offered in trucks, Volvo will not bring a dual-clutch option to the coach market. I understand that there are also no plans to offer a fully-automatic (rather than an automated manual) although ZF does now offer options capable of taking the torque generated. Volvo’s RS1228C drive axle is used and at the front there is the Volvo IFS independent suspension system. Battery capacity is up 70% from 105Ah to 170Ah. The 9700 never really achieved the popularity in the UK that it might have been expected to, though it did fare rather better in Ireland. Nevertheless, across the two nations over 300 have been sold since they were first introduced here in 2006, more than 75% of them on three axles. 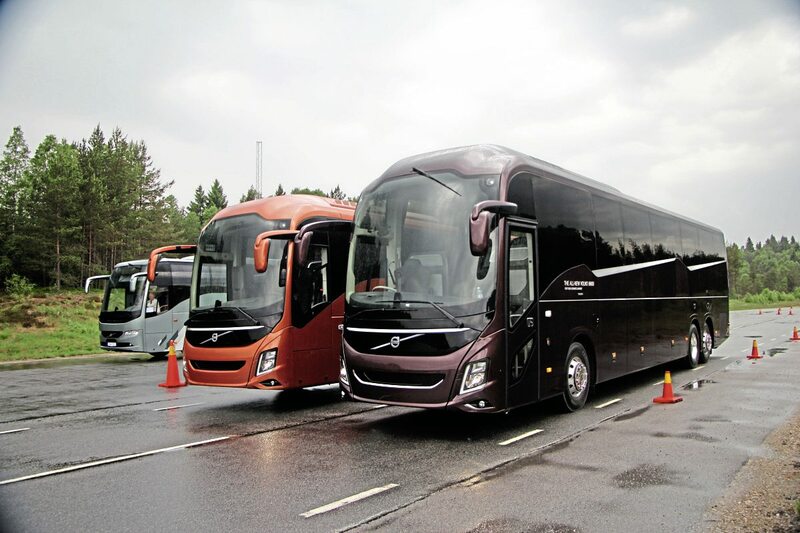 With the new 9900 models, Volvo Bus has something genuinely new with which to tempt operators and take on the likes of the integral Van Hool TX and Irizar i8 ranges, among others at the top of the market. It isn’t a huge segment, especially with so many struggling to upgrade more members of the fleet than they normally would because of ever more unreasonable emissions stipulations, but if anything can succeed in a tight market this would appear to have the credentials to do so. Why are they persisting with automated manual boxes? They make for an uncomfortable ride in urban and interurban situations, with repeated lurches backwards and forwards in the power gaps between gears. 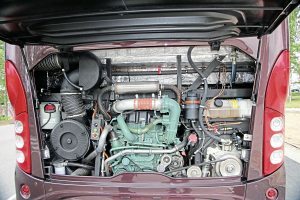 Is it not possible to design a dual-clutch system now common on cars? My understanding is that the Volvo gearbox is a 3 speed range change box with a splitter, giving 12 ratios. So there are three gearboxes. As the iShift operates, it skips ratios, even multiple ratios as it changes up and down the gears, particularly on hills. On the flat, it only changes gear 5 or 6 times to go from standstill to top gear. I don’t understand how the dual clutch system can be applied to this kind of gearbox. That’s five or six lurches backwards and forwards, and losses of power which, for the lower speed changes, happen just when power is required, pulling out into roundabouts, accelerating up slip roads etc. This may be acceptable for long-distance touring applications, but for interurban services like Stagecoach’s B11R-operated X5, with dozens of roundabouts and traffic lights, it is not. Older automated ‘boxes do this, but the latest a lot less so. It’s quite possible to drive an iShift (or any other automated manual) smoothly with almost imperceptible gear changes. Try and drive it like a torque converter automatic and it will lurch. Drive it like an automated manual and make sensible use of manual mode and gear holding and they can be as smooth as any traditional automatic or manual gearbox.